Marianne is featured in publications ranging from Newsweek to Vanity Fair. She has been called a visionary - "the voice of her generation". A compassionate and compelling public speaker, her lectures on the spiritual psychotherapy and interpretations of "A Course In Miracles" have won critical acclaim and consistently are sold-out worldwide. She is the best-selling author of the audio seminar "Live".Marianne Williamson has published ten books, including four New York Times bestsellers. In addition, she is the founder of Project Angel Food, a meals-on-wheels program serving homebound people with AIDS.Marianne Williamson also serves on the Board of Directors of the RESULTS organization. This is a program aiming to end poverty in the United States and around the world.Her many books include A Return to Love, The Age of Miracles, Everyday Grace, Illuminata, Healing the Soul of America, A Course in Weight Loss, and The Gift of Change. Marianne Williamson has been a guest on television programs such as Oprah, Larry King Live, Good Morning America and Charlie Rose. 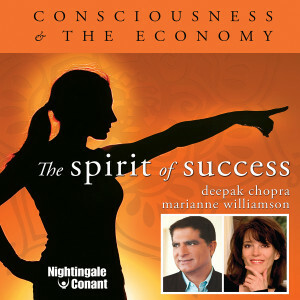 She was named one of the fifty most influential baby boomers in a Newsweek magazine poll.In 1985, Deepak Chopra left a successful and highly regarded position as chief of staff at The New England Memorial Hospital in Stoneham, Massachusetts, in order to dedicate his life to expanding the impact and effectiveness of conventional medicine. Today he is nationally recognized in the holistic health field for popularizing Ayurveda, India's ancient system of natural healing and one of the fastest forms of alternative treatment in America. Through his extensive research and teachings-he has taught at Tufts and Boston University Medical Schools-Dr. Chopra has discovered practical and achievable skills that enable people to take control of their lives, remain more robust and youthful as they age, and access the body's unlimited natural pharmacy-the keys to perfect health and total well-being. Dr. Chopra is the author of several audio books -Ageless Body-Timeless Mind, Magical Mind-Magical Body and The Higher Self.Deepak Chopra has written over 70 books which includes 21 New York Times bestsellers. His books have been translated into 35 languages and have sold more than 20 million copies. Receiving many awards, including the Oceans Award, the Cinequest Life of a Maverick Award, Humanitarian Starlite Award and the GOI Peace Award, Dr. Deepak Chopra has been recognized by countless organizations.Deepak Chopra was born in New Delhi, India. His father, Krishan Chopra was a prominent Indian cardiologist and a lieutenant in the British army. His parental grandfather was a sergeant in the British army, who looked to Ayurveda for treatment. Deepak's younger brother, Sanjiv, is a professor of medicine at Harvard Medical School.